Hello everyone!! I hope your year is off to a wonderful start! I’ve missed you all at Vamos a Leer and I’m so excited to be back! I finally finished my PhD over the summer and I’m back in the classroom teaching. After six years away, it’s taken me awhile to get my teaching legs back under me, but I think I’ve (sort of) got things under control now. I’m hoping to contribute here far more regularly again, along with Alin, Santiago, and Kalyn, the wonderful bloggers who’ve kept us going over the last year. As you all know, as a project supported by the UNM Latin American and Iberian Institute, our focus here at Vamos a Leer is on sharing books and resources to help encourage a broader engagement with Latin America in classrooms. At the same time, we’re always striving to encourage a greater depth in multicultural content across all area studies. As a teacher myself, I’ve found that one of the greatest challenges in implementing curriculum that reflects the diversity of our world is simply in finding books and resources. 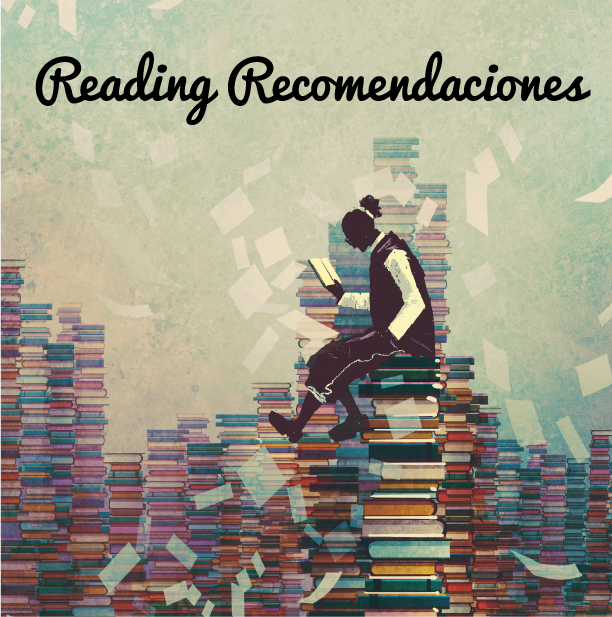 With this in mind, we’ll be starting a new thematic series of posts on “Reading Recomendaciones” that highlight various reading lists, thematic book compilations, or curated book suggestions from around the web. Many of these lists will include suggestions that go beyond just Latin American or Latinx themes, so we will highlight those books that are specific to our blog focus. One of the first resources I want to share is Mind/Shift’s 20 Books Featuring Diverse Characters to Inspire Connection and Empathy based on a list of recommended titles created by the San Francisco Public Library. The list was first shared in 2016, but many of the books are just now gaining the popularity they deserve, making them more readily accessible on bookstore and library shelves. I was really excited to see some of our favorite authors like Meg Medina, Matt de la Peña, Duncan Tonatiuh, Tracey Baptiste, Pam Muñoz Ryan, and Edwidge Danticat on the list. For those of you not familiar with Baptiste, her book The Jumbies came out in 2016, and she just recently released the sequel, The Rise of the Jumbies. One of my third graders read The Jumbies earlier this year and is anxiously awaiting the sequel I ordered for her out of our most recent Scholastic book order. I’ll let you know what she thinks of it. Another amazing resource is Gathering Books’ Social and Emotional Learning (SEL) Bookshelf —a collection of multicultural/international picture book text-sets across the five SEL competencies. This is quite an undertaking! Understandably, they are adding one competency at a time. Currently, both the Self-Awareness and Self-Management sections are available. I’ve added so many books to my classroom wish list as a result of this resource! As always, I’d love to hear your thoughts. Feel free to share in the comments below. I’m really looking forward to being a regular around here again! Saludos todos! 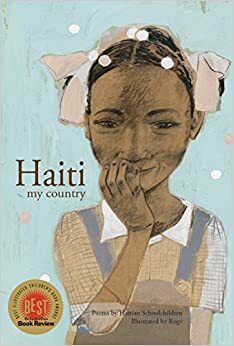 This week I will be reviewing Haiti My Country, a collection of poems written by a variety of Haitian school children, illustrated by Rogé and translated from the French by Solange Messier. As we continue with our February theme of love, including love of self, love of community, and love of others, to name a few, this book resonates primarily with themes of love of country and love of nature. Through each individual and unique poem, these children express pride in their country, adoration for its natural beauty, and, ultimately, the love that they have for themselves and for their own particular identities. This book on Haiti also harkens us back to my February posts from last year, where I used Black History Month as an opportunity to focus my book reviews for the month on books about Haiti, a country that is sometimes overlooked in our studies of Latin America. Of course, Afro-Latino culture and populations are prominent in all countries of Latin America, however Haiti’s history and society stands apart, as the majority of the population is made up of Afro-descendents, and it was the first country in the Americas to lead a successful slave rebellion. Some of my posts from last year include, Sélavi / That is Life: A Haitian Story of Hope, Eight Days, A Story of Haiti, Running the Road to ABC, and Children of Yayoute. You may also be interested in Keira’s post on Resources to Teach about Haiti and Afro-Caribbean Cultures, or Charla‘s post on Teaching about Haiti with Love. While Haiti My Country fits in with out general theme of love for this month, it also helps us remember and link back to some great resources and teaching plans from last year. Saludos todos, and welcome back to our weekly Mira, Look book reviews! I hope everyone had a relaxing and enjoyable winter holiday. Our theme for this month is “unsung heroes,” including lesser-known biographies, as well as the cherished yet occasionally overlooked heroes of our personal lives—parents, siblings, teachers and other timeless inspirations. 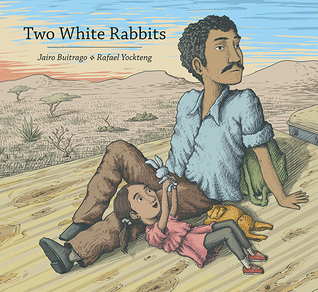 Our first book for the month, Two White Rabbits, written by Mexican author Jairo Buitrago and illustrated by Colombian artist Rafael Yockteng tells the story of a father who courageously brings his daughter across the U.S.-Mexico border. This week we are focusing on this book to honor and celebrate all of the moms and dads who’ve made sacrifices and taken risks for the sake of their children. However, while focusing on the unsung heroes in our personal lives, this book also broaches the topic of unnamed victims (within the context of immigration and refugee rights), providing a double-edged focal point for this story, as well as this month’s themes. As a result, we are kicking off 2017—a fresh start from what was, for many people, a tumultuous and anxiety-inducing year—with books that focus our attention on the people, icons, heroes large and small, and even victims that are often overlooked, unsung, unnamed, or forgotten. Feliz año nuevo a tod@s! We’re excited to come back in 2017 with a renewed dedication to sharing and celebrating the wealth of literature focused on Latin@ experiences in children’s and YA books. We start the year inspired by the outpouring of community-focused sentiments and social justice emphases that have emerged in the last two months. With this in mind, we’ve decided that now is a good time to focus in on a conversation about social change and how it happens. How do we achieve a more just and equitable world? A world that prioritizes multicultural experiences and backgrounds rather than denigrating differences? Though these questions merit much larger conversations than we can engage in here, we can offer at least one approach: to think of change as something brought about not only by famous, charismatic leaders, but more so by thousands of individual actions. We’re talking about actions that may be public or private, societal or familial, formal or informal, quiet or loud, compassionate or fierce, to name but a few of the many variations. To get at what this spectrum of change looks like in practice, we’re using the month of January to move beyond traditional heroes and to consider lesser known stories and “unsung heroes” in children’s and YA Latin@ literature.What are the stories in Latin@ literature that can spark change and inspire young readers? We hope you’ll join us along our journey now and in the coming months. As always, thanks for being here and we look forward to hearing your thoughts and ideas! Image: Adapted from photograph of mural commemorating the Madres de la Plaza del Mayo in Argentina. Reprinted via CC © from Flickr user Seven Resist. Saludos todos! As many of you know, once a month we like to take the time to give special attention to our featured authors and their writing.This week we are featuring Edwidge Danticat, the prolific, inspiring author of many children’s, young adult, and adult books, whom many of you may also recognize from several of my previous ¡Mira, Look! posts. Danticat is originally from Haiti and her books often deal with the culture of Haiti and the immigrant experience, providing a wealth of information on the country’s history, culture and current events. Edwidge Danticat was born in Haiti and moved to the United States when she was twelve. She is the author of several books, including Breath, Eyes, Memory, an Oprah Book Club selection; Krik? Krak!, a National Book Award finalist; and The Farming of Bones, an American Book Award winner. She is also the editor of The Butterfly’s Way: Voices from the Haitian Dyaspora in the United States and The Beacon Best of 2000: Great Writing by Men and Women of All Colors and Cultures. Saludos todos! As many parts of the country recently celebrated Columbus Day, and we are quickly approaching Thanksgiving, we wanted to take the time to draw attention to a new educational campaign, Abolish Columbus Day, created by the Zinn Education Project (a project of Teaching for Change and Rethinking Schools). Teaching for Change and Rethinking Schools are both excellent resources for educators interested in multicultural teaching, diverse literature and social justice, and we’ve featured their resources many times here on the blog. This initiative aims at rethinking Columbus Day and the way in which our history remembers the genocide and continued colonial practices against the indigenous peoples in the United States and Latin America.